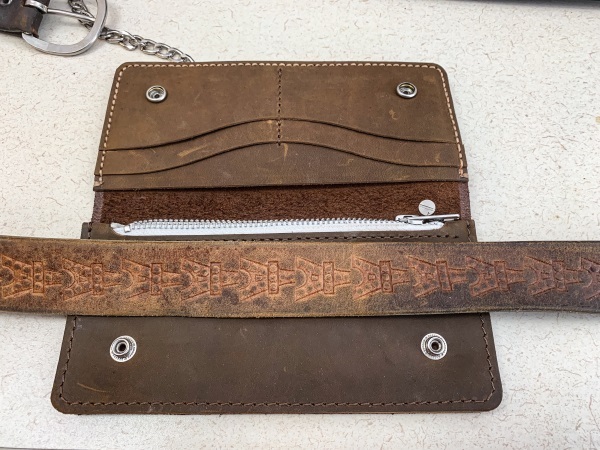 REVIEW – Over the years I have purchased many wallets of various sizes, capacity and build quality, and much like my gear bags, I can never seem to find one that works for every occasion in terms of my outfit and carrying capacity. I now have the opportunity to test and review a different type/style of wallet. 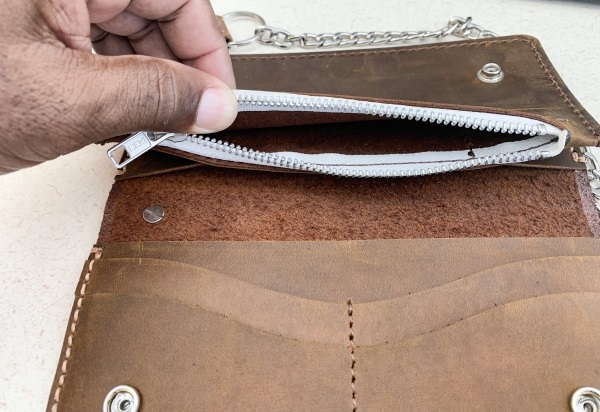 The JooJoobs Leather Biker Wallet is an entirely new adventure for me. So let’s see! 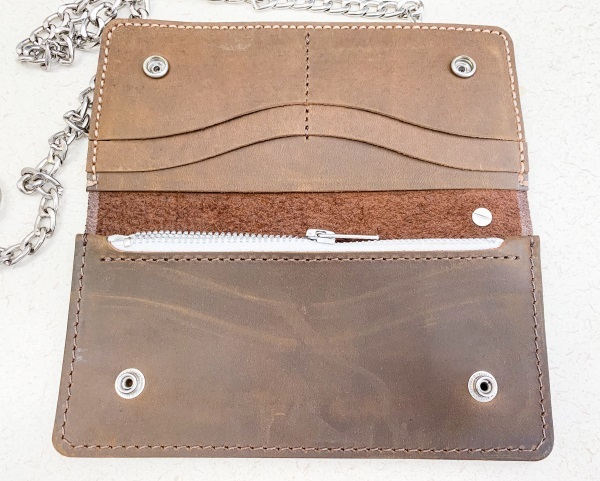 The JooJoobs Leather Biker Wallet is crafted using premium full-grain distressed cowhide leather. 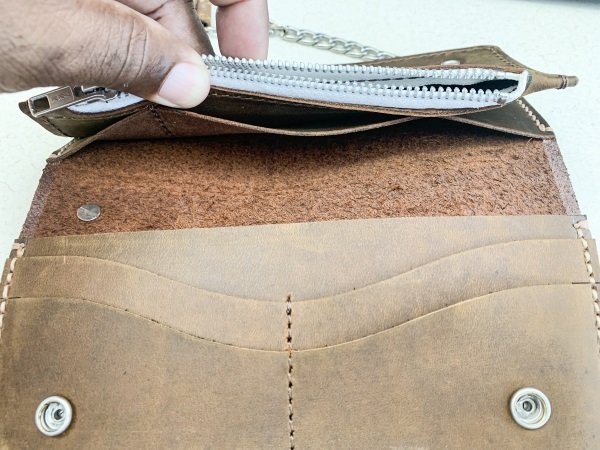 It features several card slots and inside pockets. It also features a zippered pocket and is built to last. 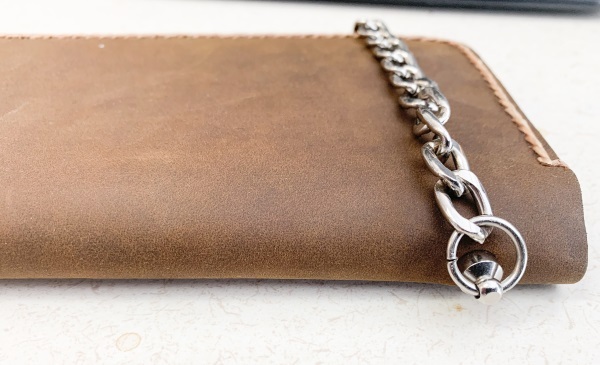 This well made and well-stitched wallet has a security chain attached to it via a lug and screw. 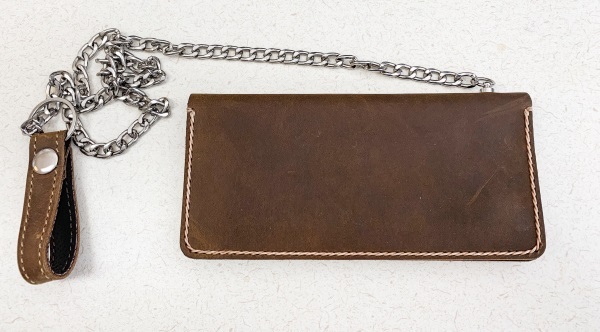 The chain is 20 inches long and has a leather strap with a clasp attached to the other end. When you open the wallet, there are clasps that allow it to be closed and secured either by itself or over a belt. There are also credit card/ID slots and a zippered pouch. Below the credit card/ID slots there is a cell phone pocket. 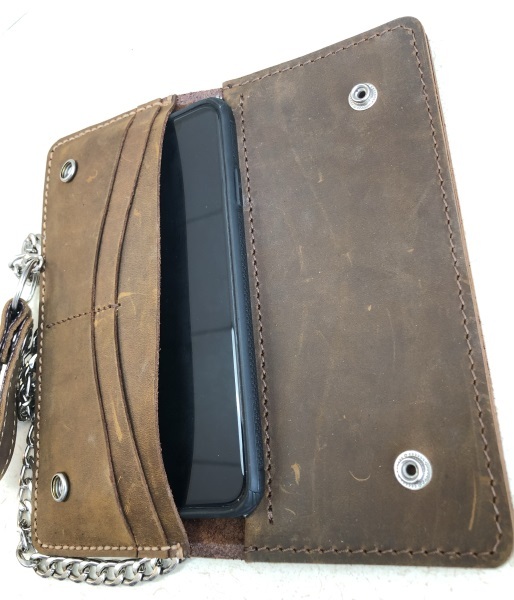 On the side opposite the credit card slots, there is a zippered pouch, and below the zippered pouch, there is a pocket that can be used for money, etc. This wallet is very well made and well stitched. It leather also feels very good in my hands. In my opinion, it has enough slots and compartments to accommodate the EDC cards and money for most people. I am one of those people that carries extra “stuff” in my wallet that I really don’t need, so whenever I use this wallet, I will have to be selective of what I include. The cell phone slot does hold my iPhone 10 XS Max, but only with a slim case as shown below. 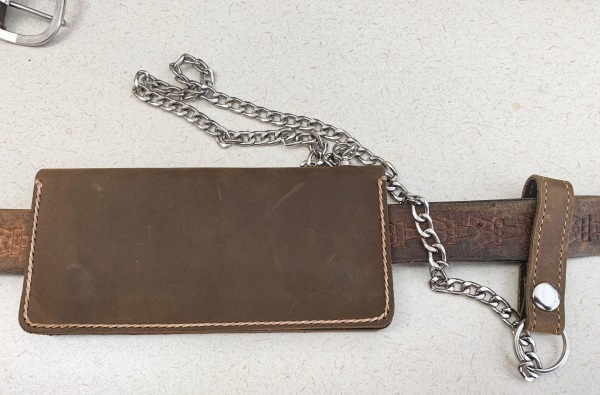 The wallet clasps together so that it is able to be worn on a belt, and the chain can also be tethered to the belt via the leather loop and clasp. 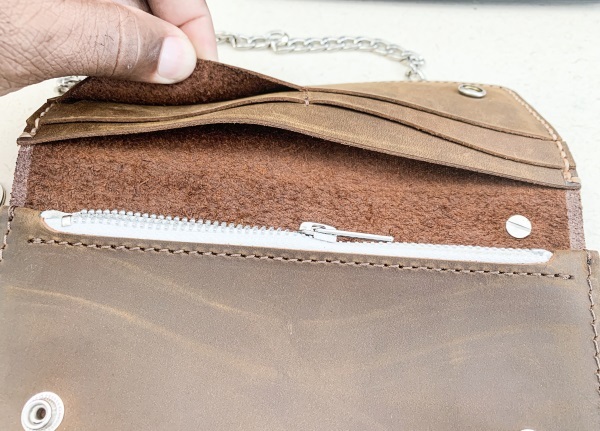 The build quality including the leather used and the stitching. When I first took this wallet out of its packaging, it seemed a bit clunky and impractical. However, as I tried it out for a while, it has grown on me. 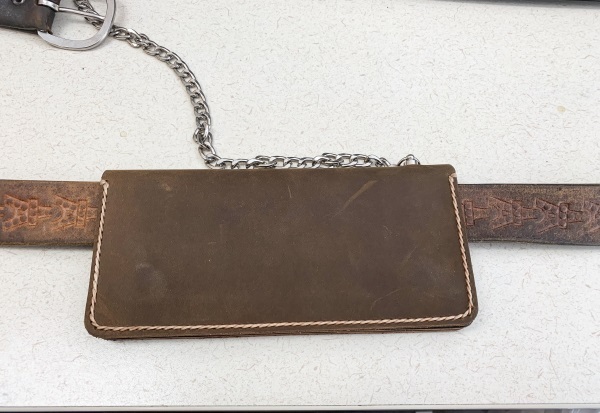 I like its ability to be carried on my belt, but I am concerned about how the curvature of my belt around my body will affect it over time. 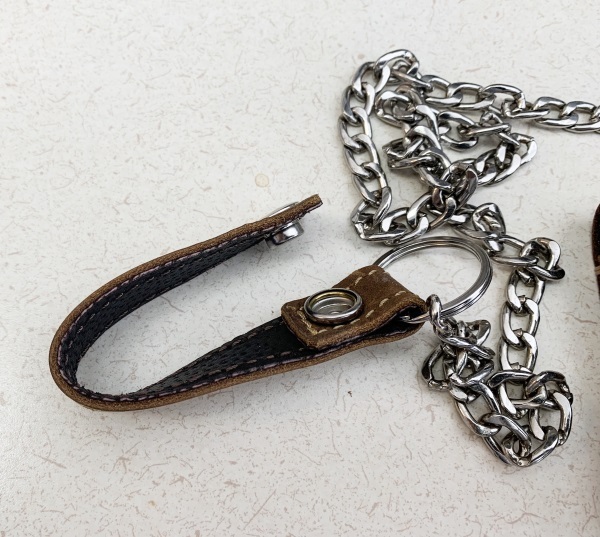 It can also be carried in my back pocket, and although it might be awkward, it can be carried in my jacket pocket albeit that the chain cannot be easily detached. 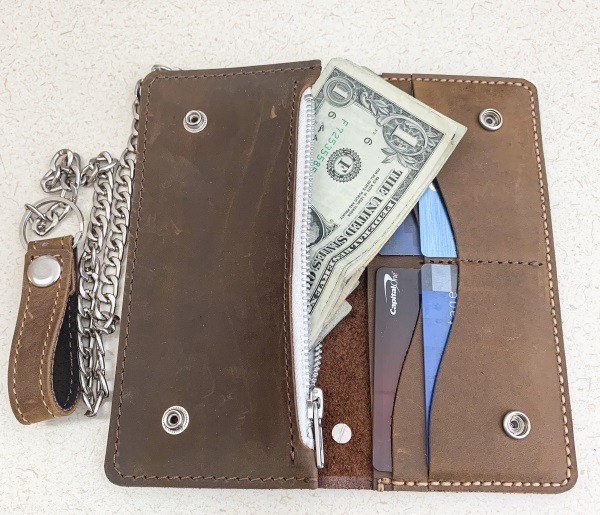 Regardless, this wallet is manufactured primarily as a biker wallet, and in that capacity, it is my opinion that it would be absolutely fantastic.